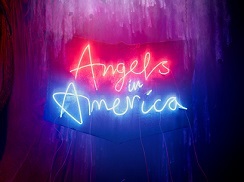 I really enjoyed the NT Live screening of Angels in America. 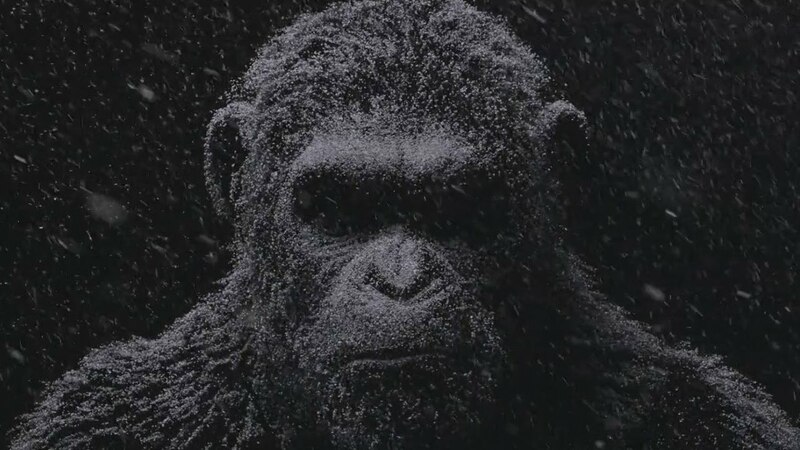 I particularly liked the way they did the CGI Apes, and the jungle was really realistic and I’m not one for CGI usually. In Act 1 the picture cut out. Not that unusual (annoyingly) in these feeds, but it’s live, these things happen. For about 5 minutes it was a radio play (Missing a bit of key dialogue when that cut out too) . These things happen. Again in Act 2, just at the Hot Dogs scene (one of my favourites again). Suddenly the title plate for Planet of the Apes appeared. No, surely they can’t….oh yes, yes they can. Planet of the Apes, played on screen while Joe and Louis continued to talk about Politics, and Miss Ron Reagan Jnr (the pardon the expression heterosexual). So forgive me if from now on, the Reagan family is forever a bunch of Apes to me. The cinema were in fairness apologetic, and gave vouchers to audience members to make up for it. But still this does highlight some of the issues with NT Live, that things go wrong and ultimately you’re not in the room. I know this is an issue for some people. And it’s obviously an issue for those of us who have Apes playing instead of Angels. And yes, as an utter Angels snob I have issues with some of the camera angle choices, and yes, it did lose some of the intensity and intimacy of being in the room. But you as much as I came into this post expecting to write about that in some detail. I can’t. Why? 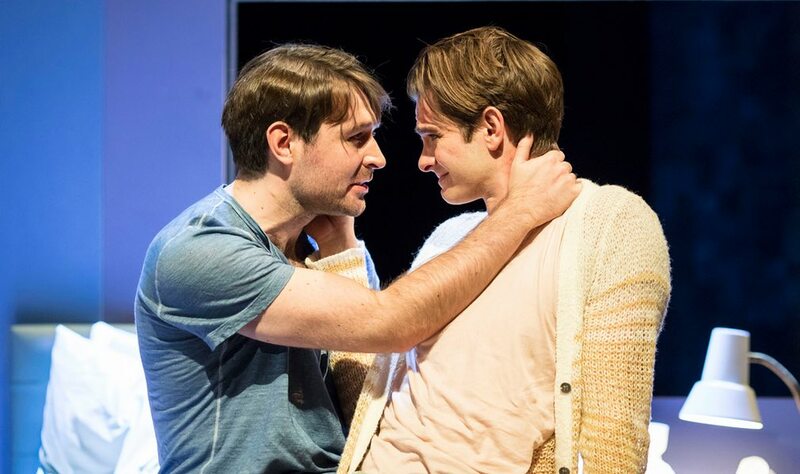 because last night (and beyond) Angels in America was beamed around the world to 100s of 1000s of people. And it was preserved in gloriously filmed quality forevermore. As a) someone who doesn’t live in London b) someone who is perpetual broke c) a researcher/theatre historian I cannot find fault with this. Firstly the chance for those who do live close enough but couldn’t get tickets, those who could never travel to London for it, and those on the other side of the world. Whatever their reason for wanting to see this play, love of the writer, the subject, the cast, they get to see it. As a researcher/historian who only previously had static camera footage from the back of the auditorium, from the early 90s, this is a godsend. That the NT is preserving in a different way aspects of their history is wonderful and fascinating. And ultimately it’s the lucky ones who were able to be in the room who complain, say that it’s not the same. The harsh truth is: this isn’t for you, it’s for everyone else. I adore NT Live and the access it gives, also in terms of those people not comfortable in a cinema. So if it’s not for you, that’s fine. But it is for a lot of other people. NT Live related waffle aside. The experience of seeing it again was really emotional, intense experience. On one hand, related to it being the broadcast, I was really nervous that it would go right that it would be preserved for posterity in it’s best shape. And conscious that this is also a really high profile show, and that the cast get it right. And well, I’m just over invested in that sense. On a personal level as well knowing people I know were watching it (mostly due to my years of relentless harassment) made me worry they’d not like it. And on the other side of the Atlantic my ‘brain twin’ my friend who is the mirror image of me in nerdy pursuits, and my friend because of Angels, was watching this beloved production of ‘mine’ and for the first time ever we’d be watching the same production. That’s just a lot of emotional investment for a rainy Thursday evening in July. Luckily, I think none of us were disappointed. I’ve never said this production was perfect, and if anything multiple viewings are allowing me the luxury of figuring out what the fixes I’d make, the imperfections are. But to have a production, and a chance to do that at all is still magical. For me things in the production had come on leaps and bounds since I saw it in previews (the very first two show day in fact). As you’d expect everyone has grown into their characters more, and everything feels much more settled, but also much more developed. In particular Russell Tovey seems to be having more fun with Joe, but also found more of his depths. He’s a very different Joe to others, but as an adorable puppy dog version he works incredibly well. Meanwhile Denise Gough is doing what Denise Gough does and soaring with Harper. She’s so sharp, and knowing while in the midst of her madness that it’s scary, and brilliant. I still adore what Andrew Garfield does, I admire his portrayal of Prior, and it’s difficult to doubt his emotional commitment to the part, in close up particularly the nuances of his performance were more apparent and I am fascinated by his take. Meanwhile my sheer devotion and worship of Mr James McArdle doesn’t waver. Yes Louis is my favourite character but that means I’m even harder to win over with him, but I am won. He also has really grown and settled into Louis- his ‘Democracy in America’ speech is a tour de force, and he is more emotional, but also more playful when it’s called for- a real joy to watch. Seeing them all in close up, but also seeing the interactions across the play again lets it really sink in just how good they all are. 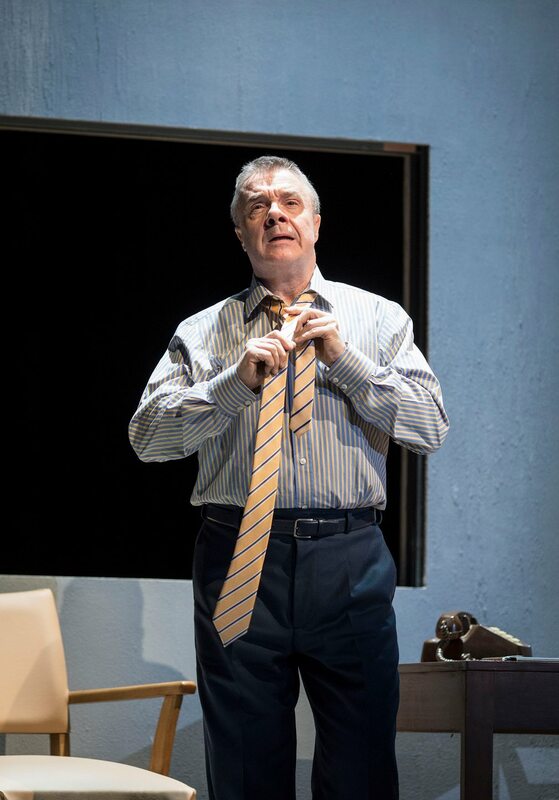 And Nathan Lane. Ah Nathan. To quote a friend who shares similar opinions of him that I do ‘Well who knew he had it in him?’. No he’d never have been my choice for Roy, but then neither would Al Pacinio and he’s still brilliant. As is Lane. In close up and on film I’d feared he’d be just too much but actually he walks that line well. The set as well, given the luxury to see it all from the camera angles rather than craning my neck in row C, my God that works. The boxes that form a perfect New York Living metaphor, and the swirling platforms, spinning clockwise as part of the perpetual motion of the set. It’s been a long time since I saw a set so seamlessly tell the story along with the dialogue. And the filmed version was a gift for that. 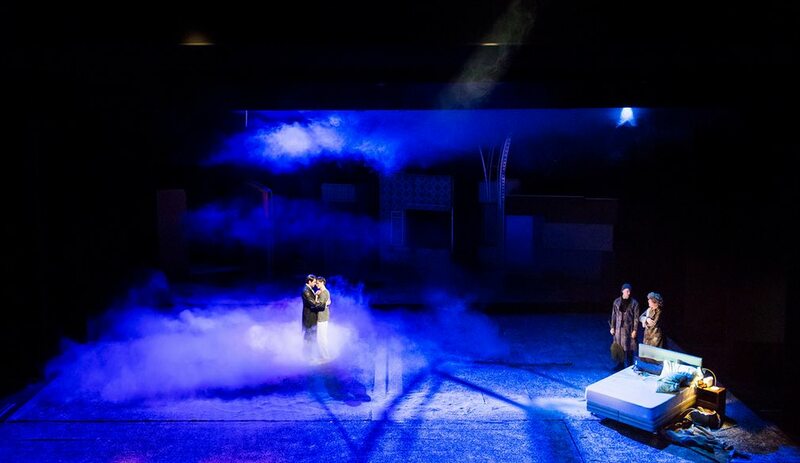 When the set pulls back and Harper’s Antarctica appeared I shed happy tears because it was all so perfect, and it was being shared by so many people at that moment. It doesn’t get any better than that. Talking of tears, I had a bet with myself as to when I’d cry first. I choked up at ‘KS baby’ and again at ‘Rainy afternoon in March’ (I’m a sucker for Louis, I have emotional problems what can I tell you). Instead of soft lady-like tears what I had in general was what I can only describe as a lump of emotion in my chest. I let out a kind of gasp-sob when Prior screamed ‘I wish I were dead’. And let’s just say nobody better play ‘Moon River’ near me any time soon. But ultimately when I got really emotional was at the curtain call. Going back to my earlier point, just the emotion that this was a thing that had now been shared that ‘my’ play, the one I’d been banging on and on to anyone who would listen to read, to see, had been shared around the world. And that the cast (and crew) had done an amazing job in making it happen. I was a proud nerd right then. And this is only Part 1. It’s a different experience seeing them a week apart, but actually I was so drained last night that I was glad of the breather. Is it the same as being in the room? no, but the ‘magic of the theatre’ really did manage to translate across the screen. Even with a short Monkey interlude. See you on the other side for part 2. The Great Work Begins. And if anyone can find me the Octopus mug that Roy has in his first scene, I’ll love you forever.